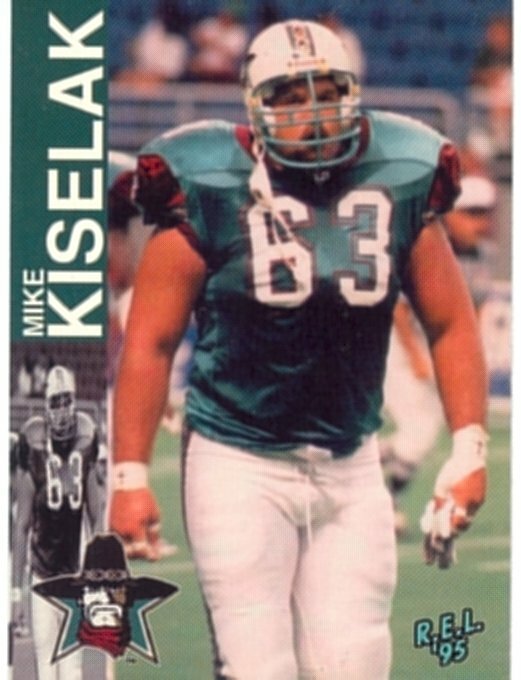 Mike Kiselak was a bit of a rarity in the CFL, an import Center. Kiselak started his pro career in 1990 and bounced around the NFL with tryouts with Kansas City, Houston and the New York Giants. There was also a stint with the San Antonio Riders of the WLAF. Kiselak joined the CFL in 1993, but didn't have to travel to Canada to do it. In 1993, the CFL launched its American expansion with one team in Sacremento and Kiselak signed with the Goldminers. Kiselak played two years in Sacremento, and then as a free agent signed with the transplanted Goldminers in San Antio where they became the Texans. In 1995, with San Antonio, Kiselak was both a South (the only year for that division) and a CFL All-Star at Center. With the folding of the American teams, Kiselak was selected by Saskatchewan in the dispersal draft, but traded to Toronto for OL John Terry before the season started. Kiselak played two years in Toronto, winning about every possible award for an offensive lineman during those two seasons (1996 and 1997) He was an East All-Star, CFL All-Star and the CFL's Oustanding Offensive Lineman in both years. That brought the attention of the NFL again, and Kiselak signed with the Dallas Cowboys after the 1997 season. Unfortunately, Kiselak's NFL career with Dallas was only one game.